On L.A.’s industrial outskirts, the town of Irwindale had seen its population grow almost tenfold in the preceding hours, all contained within the half-square-mile footprint of the “House of Drift,” Irwindale Speedway. If you’ve ever been to its annual Formula Drift season finale, you’ll know it doesn’t take physics to predict the result of that rapid influx of mass and energy on such a concentrated area. And in that moment, no one felt the heat and pressure more than Fredric Aasbo. The wait is almost over. The start of season 13 of the Formula DRIFT Professional Championship is nearly upon us, Round 1 of 8 for ’16 on turns 9, 10, and 11 of the famous Grand Prix of Long Beach, Calif., street circuit. And we couldn’t be more stoked. As per usual, the series held a Media Day a few days ahead of the event to reveal any late-breaking announcements, make some of the drivers available for interviews, and even get some of the assembled journalists a ride-along in a pro drift car – basically empowering the press to generate some buzz on FD’s behalf. At the top of the order was news that Formula D and championship title sponsor BlackVue had come up with bonus prize money – to the tune of $25,000 – for the driver that can win three specific events, Round 1, Round 4 at Wall Stadium in New Jersey, and Round 5 at Evergreen Speedway in Washington. Everyone also got see a handful of returning cars with fresh liveries and new entries for the first time. Chris Forsberg’s NOS Energy Nissan 370Z, Fredric Aasbo’s Rockstar Energy Scion tC, Ken Gushi’s Greddy Performance Toyota 86, Ryan Tuerck’s Gumout 86, and others rocked new skins, while hot shoes like Vaughn Gittin, with his 2016 Monster Energy Ford Mustang RTR, and Mad Mike Whiddett, with the Red Bull “RADBUL” Mazda ND MX-5 Miata, sported new (or newish in the case of Mad Mike) machines. We will be covering all angles of the event this weekend, with reports (including live video) on our social media channels as well as results and recaps here on the website. However, if you can’t be in Long Beach and want to watch the crazy sideways action blow by blow, make sure to check out the Formula D Livestream. SAVE THE DATE!!! 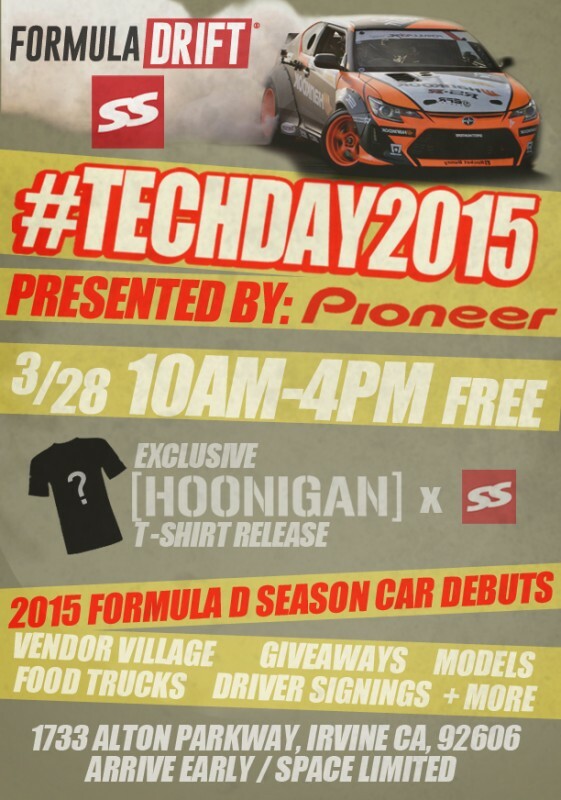 3/28/15 #‎TECHDAY2015‬ Presented by Pioneer is upon us! Get ready for a day full of Formula Drift Team debuts Food Trucks,Giveaways, Superstreet​ Model Calendar signings. Over 800 cars on display plus MUCH MUCH MORE!!! and it’s all FREE!!! 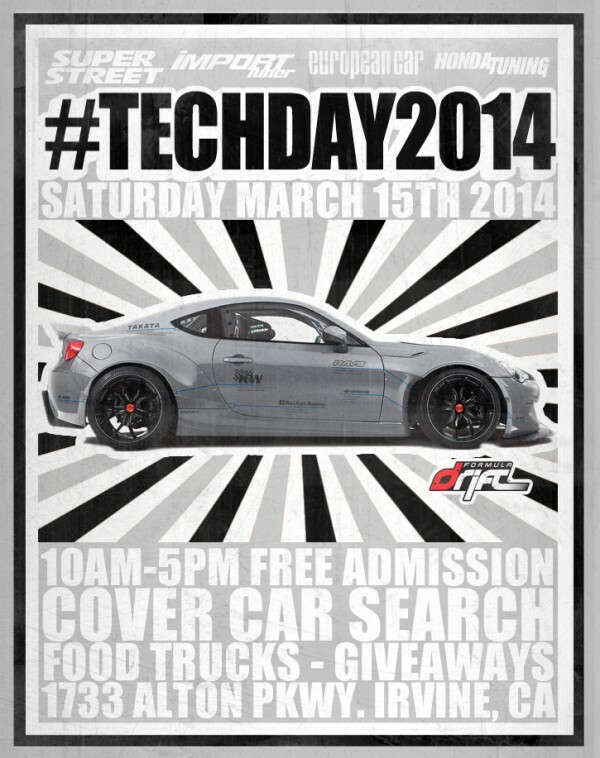 Super Street, Import Tuner, European Car, & Honda Tuning Magazine is hosting the 2014 Formula DRIFT Annual Tech Inspection.